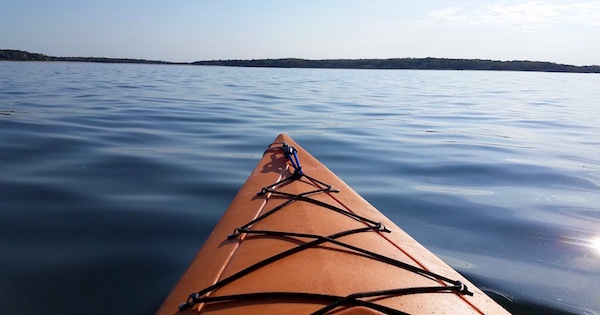 This is the perfect time of year to get out in the creeks and harbors and to venture out into the big wide Peconic Bay in a kayak — the mornings tend to be still and warm, the water is the perfect temperature, and the weather usually cooperates to make for a great day out on the water. Explore the Peconic Bay and its beautiful habitats! Join PEP educators as we paddle the Coecles Harbor Marine Water Trail in Shelter Island on Tuesday August 16, 2016 from 9 a.m. to 1 p.m. 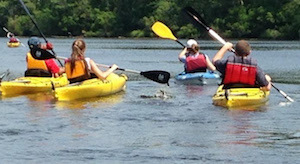 Participants must provide their own paddling equipment (kayaks, paddle boards, etc.) and life preservers are required. Bring your own or prearrange rental from Shelter Island Kayak Tours at 631.749.1990. Rented kayaks will be delivered to the launch site at the end of Burns Road Town Landing in Shelter Island. Participants must be 18 years or older or accompanied by a caregiver for the duration of the event. Please bring water, sunscreen, and lunch. Also a towel, water shoes, and clothing that can get wet are recommended. Email [email protected] for more information and to register. Attendees at this East Hampton Trails Preservation Society event will meet at the Northwest Creek access at the end of Northwest Landing Road for a short paddle on Northwest Harbor to a picnic spot (BYO picnic), catch the sunset and moonrise, and return by moonlight. Bring a flashlight and dress for a cool evening on the water. Paddle leader Mike Bottini ([email protected]). Contact Mike if you need to rent a kayak or SUP. Bring a picnic dinner to enjoy al fresco at the picnic tables, then we will enjoy a guided and peaceful paddle on Old Ice Pond. The sun sets at 7:46 p.m. and we will enjoy twilight until 8:16 p.m. The very almost full moon will be rising, and enjoy a magical experience of paddling on the pond in the dark. Kayak or canoe experience necessary. $30 per person at time of reservation. Space is limited and reservations required by calling the refuge at 631.653.4771. Join Group for the East End for a scenic evening paddle on one of the East End’s more tranquil, yet expansive water bodies – Napeague Harbor. The calm nature of the harbor combined with the natural habitat surrounding it will make for a delightful setting as we paddle and wait for the Full Moon to rise. Recognized by Audubon NY as an Important Bird Area, we will seek looks before the sun sets at many of shorebirds that visit the area during the summer. Group for the East End will cook dinner, but please bring something to drink. Fee for the paddle and BBQ is $35 ($15 for children under 12). If you do not have your own boat, single kayaks can be rented for $40, double kayaks for $70. For more information or to make a reservation, please contact Aaron at 631.765.6450 ext. 218 or [email protected]. 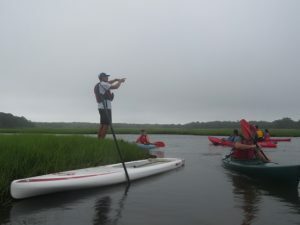 On this nature paddle, we visit a floodtide delta and the site of an old inlet and learn how natural coastal processes and human activities have shaped this harbor’s shoreline. Advance reservations are required for all SoFo events, which are free for members and cost $10 for adult non-members and $7.50 for child non-members. For more information, reservations, and directions to meeting places, please call: 631.537.9735.